Q. You looked okay in the first set. Did your physical or mental condition change after that? What happened? RAFAEL NADAL: No. As I said the other day, these things happen after long time without being on the road, being on rhythm, being on competition. So I think I think I played a great first set, a lot of winners with my forehand, no mistakes. But at the end I had a bad game in the third one, fourth one of the second set. He break me. After that everything changed. He played well. I was playing with more nerves than usual after‑‑ as I said before, after long time I wanted to win. I know that winning couple of matches here will help me. So that makes me play a little bit more under more tension. But that's it. You know, at the end, that's the sport. That's normal things. When you are back from an injury and you are back again from an injury, that takes time. There is risk. And always, when you are a time outside that the things are complicated at the comebacks for everybody, no? You can see all the comebacks from a lot of players when they were injured from long time, the comebacks are tough. I'm not an exception. I am another one that will be tough for me. I'm going to work hard to try to make it less tough as possible, but my motivation and my hunger to keep doing the things well still the same, so I am sure that I gonna come back to my best. I hope to be soon. Q. Losing a match in the first tournament of the season may not be a disaster, but do you feel confident that you can pick up quite quickly from this, or do you have a feeling how long it will take? Q. Just your game, your general game. 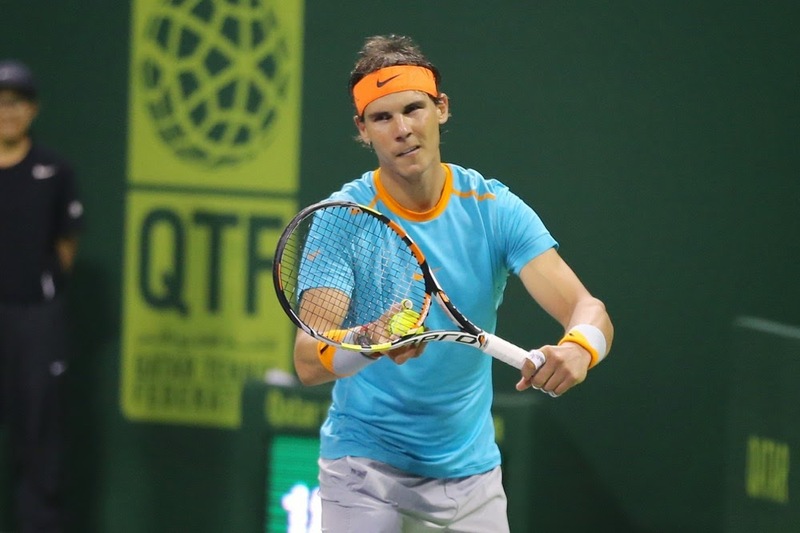 RAFAEL NADAL: No, mentally is just a lose. No, at the end that not gonna affect my career, that lose of today. That's the really thing. But at the end is a tournament that I like. First tournament of the year is, as I said before, especially after long time without playing, I wanted to do well. Playing two, three matches, four will help me a lot to be a little bit better. But that's not the case. So accept that. Be ready for what's going on, try to play a good tournament of doubles. Playing doubles is competition at the end. Gonna help me to be on rhythm. So I gonna try my best to do it well tomorrow in doubles, and for the rest, try to practice as much as I can and put my physical performance on the right position. And then talking about tennis, I can do it better but was not that bad. Was a little bit unlucky for moments of the match that I felt that I had the chance to be back on the match or to finish it a little bit, no? Was some moments that I had some chances that was one ball like this (indicating short distance between index finger and thumb), one lob shot important one that was on the line, some different points that was all the time from the opponent, not from me. And at the beginning, you know, you need that little bit of luck to be more confident, to play with a little bit more, you know, relax. That's it. Q. I realize you're still in doubles here. But once you get to Australia, would you consider playing maybe an exhibition match at Kooyong or a wildcard in Sydney if you happen to lose earlier here in doubles than you anticipated? RAFAEL NADAL: Is not in my mind. I don't know. Difficult for me to think about that now. Is very early, but I am quite sure that I have to talk with the people that I have to talk. But then if the people that I have to talk has different opinion, then I am a guy who listen and try to do the things that the people believe that are better for me, not only take my decision and that's it. But Auckland or Sydney for me today is not in my mind. Q. You have a history in the past of coming off a season where you have had injuries and whatever even stronger than you had been before that. Are you confident that you can do the same after the 2014 season? RAFAEL NADAL: If I am stronger, I gonna be the best of the history, so that's not gonna happen. I don't gonna be stronger than before, no. So no, no, no, no. I'm sure that it's gonna takes time. I was not ‑‑when I came back, I was not stronger than before. I had amazing year, but ‑‑ 2005 was amazing year. 2008 was a fantastic year and without coming from injury. And 2010 was a great year after a tough year, 2009, for different things, no, but especially for the knee. But two toughest, three toughest time that was injury for me was 2005 to 2006, you know, and take a little bit of time for me to be back on my best, even if I won at Dubai, the second tournament that I played, then was tough to feel a little bit that I was in rhythm. And 2013 was amazing comeback, but as I say the other day, I come back on perfect conditions for me, on clay, 250 tournaments. All the facts was on my favor. This time is a little bit different. This one is the third one, so we will see. We will see how the thing goes in a couple of months. I wanted to start well. Was not the case today. I want to play well in the Australian Open. That's a tournament that I like a lot. I don't know if it will be the case, but I gonna work for it. If not, you know, I gonna play in Rio de Janeiro, I gonna play in Buenos Aires. I need to be ready for that. The season is long. After, when you come back after an injury, you cannot only see the immediate moment. You have to take a look a little bit farther. That's normally, during my career, I was looking always tournament by tournament. But now in my mind is practice well, try to be ready for Australia, but knowing that can happen that I gonna go to Australia and lose early. It is true if I'm able to practice well and find my rhythm, if I'm able to win a couple matches there, then anything can happen. Can happen that I gonna arrive there and I gonna lose early, but I don't know. Q. How hard will it be for you to go to Australia, knowing you don't have enough matches and may be a little rusty and not have expectations possibly of winning and thinking you can lose early? Is that difficult for you going into a Grand Slam, mentally, to accept? RAFAEL NADAL: I don't want to see that way. Will be hard if I will see the thing that way, but I don't want to think that way. I gonna think that I have my chances. But anyway, will not be hard. Playing in Australian Open never will be hard as a tournament. It's a fantastic tournament. It's one of the best tournaments of the world with a great organization. If it's hard to go to the Australian Open, better go home and don't play tennis. But anyway, will not be the case, because in my mind is play a good Australian Open.